This soothing Cucumber Purifying Spa Mask is packed with a combination of natural plant extracts, moisture-rich Cucumber and vitamins. The revitalising Papaya and Indian Lotus Flower creates a relaxing facial experience, leaving your skin feeling cleansed and refreshed. Gently purifies and refreshes the skin - Soothing Aloe Vera and revitalising Papaya renews skin cells - Hydrates and balances the skin’s moisture content - Fast-acting and enjoyable to use. 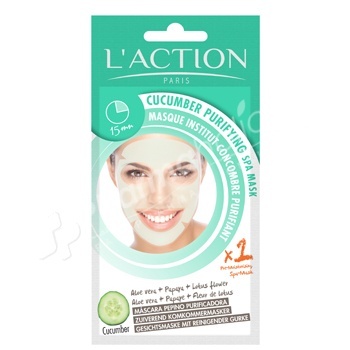 Apply the Cucumber Purifying Spa Mask and leave for 15 minutes, remove the mask and gently pat skin dry.